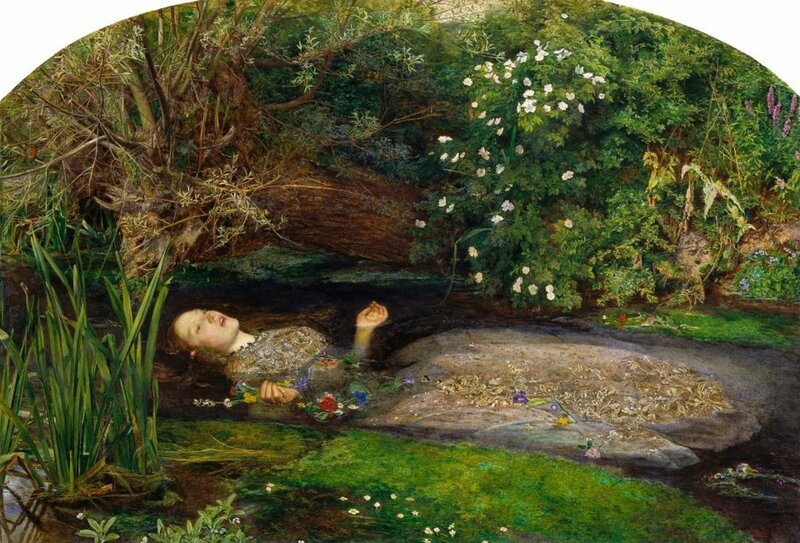 The Pre-Raphaelite artists of Victorian England painted many Shakespearian characters, but Ophelia was a particular favourite. 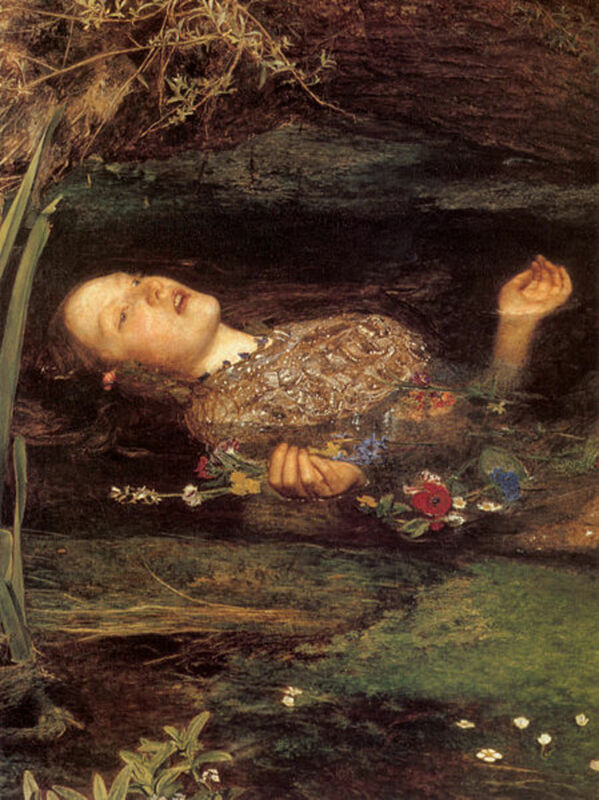 The sad death by drowning of Hamlet's sweetheart has captured the imagination of numerous artists, but John Everett Millais' well-known painting of a pale, red-haired Ophelia floating in still, dark water, surrounded by overhanging greenery, and a drifting posy of flowers, is surely the most famous of these images. John Millais was a founder member of a group of Victorian artists known as the Pre-Raphaelite Brotherhood. 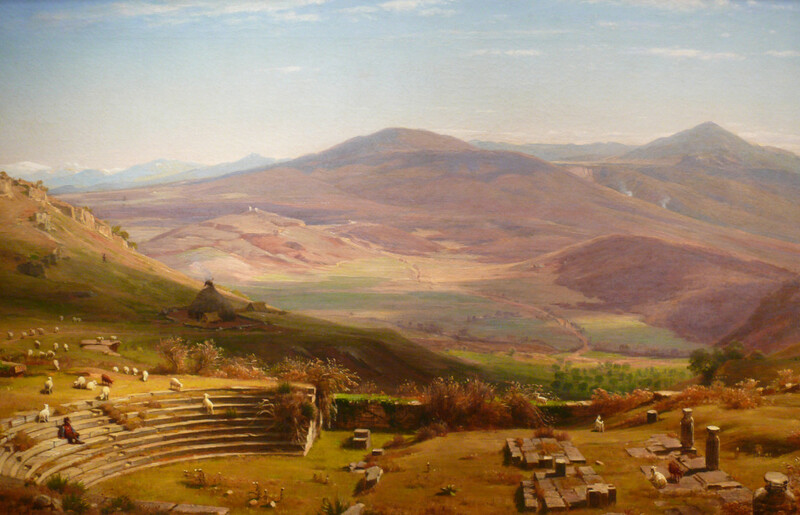 He was dedicated to producing a fresh and naturalistic realism in his art, and had a very good eye for detail. Millais planned his painting of Ophelia with meticulous care, beginning with the background, which he painted directly from a section of the Hogsmill River in Ewell, Surrey. The laborious task of faithfully recording every bud, every leaf, and every blade of grass took Millais a solid five months of work. He sat painting on the riverbank for up to eleven hours a day, six days a week, and as the summer of 1851 wore on into autumn, and the weather began to turn against him, he had a little hut erected to shelter him from the rain and wind while he worked. The second stage of Ophelia was completed in Millais' studio at 7 Gower Street in London. Nineteen year old Elizabeth Siddal agreed to model for the painting, and she was made to lie fully clothed in a full bathtub in the studio. By now it was winter, and Millais was obliged to place oil lamps under the tub to warm the water. Unfortunately, however, he soon became so engrossed in his work that he failed to notice when they went out. As a result, Siddal caught a severe cold, and her angry father sent Millais a letter demanding £50 for medical expenses, though eventually a lower sum was agreed. 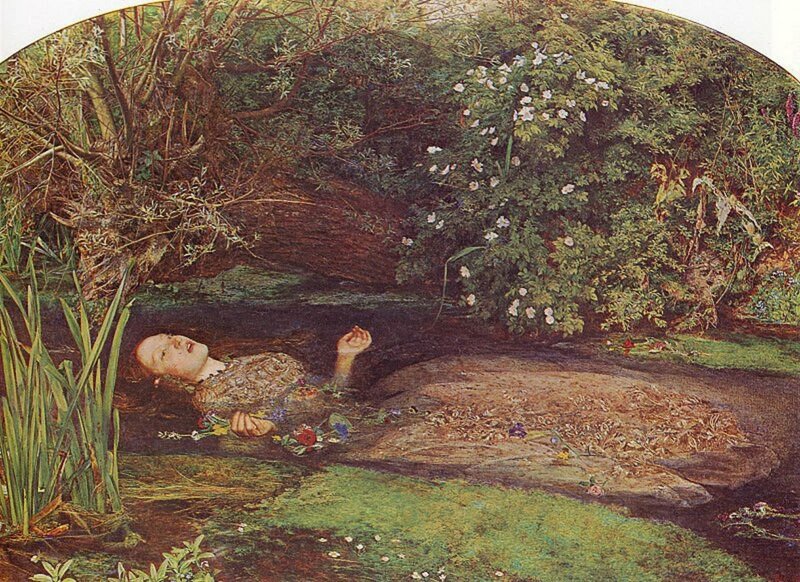 The flowers shown floating on the river correspond with Shakespeare's description of Ophelia's garland. T"There's rosemary, that's for remembrance. Pray you, love, remember. And there is pansies, that's for thoughts," said Ophelia to her brother Laertes. "There's fennel for you, and columbines. There's rue for you, and here's some for me; we may call it herb of grace o' Sundays. O, you must wear your rue with a difference. There's a daisy. I would give you some violets, but they withered all when my father died." The flowers illustrated also reflect the Victorian interest in the "language of flowers", which suggests that each bloom has a symbolic meaning. Millais has included red poppies in his painting, although these are not mentioned in Shakespeare's description, and the poppy represents sleep and death. Ironically, the model, Lizzie Siddal later died tragically of a laudanum overdose. Laudanum is derived from the opium poppy. John William Waterhouse (1849-1917) painted many large canvases in a Pre-Raphaelite style. He was particularly fond of subjects from literature, especially beautiful, tragic heroines. The character of Ophelia greatly appealed to him, and he was to paint her four times. 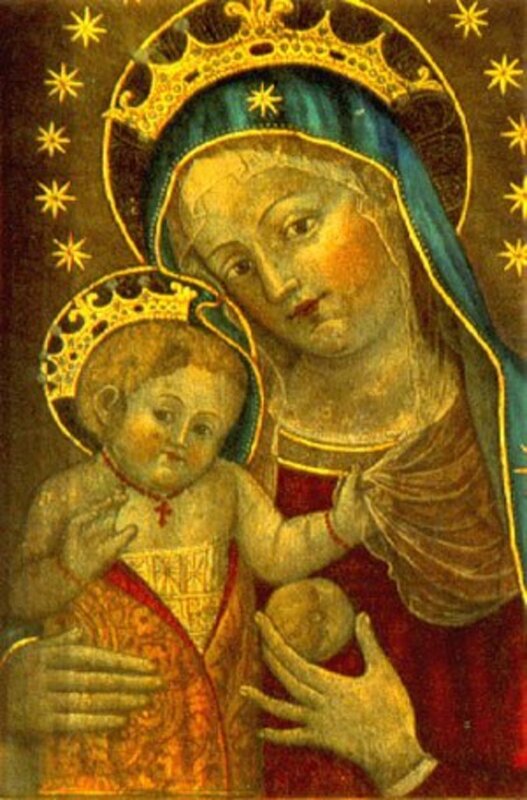 A fifth planned painting was never completed due to ill-health. In Shakespeare's play, 'Hamlet', Ophelia is the daughter of Polonius, and sister to Laertes. She has been Hamlet's sweetheart, but he rejects her love, and subsequently kills her father. These actions profoundly affect Ophelia and unbalance her mind. Her mad scene (act IV, scene 5) is one of the best known in Western literature. 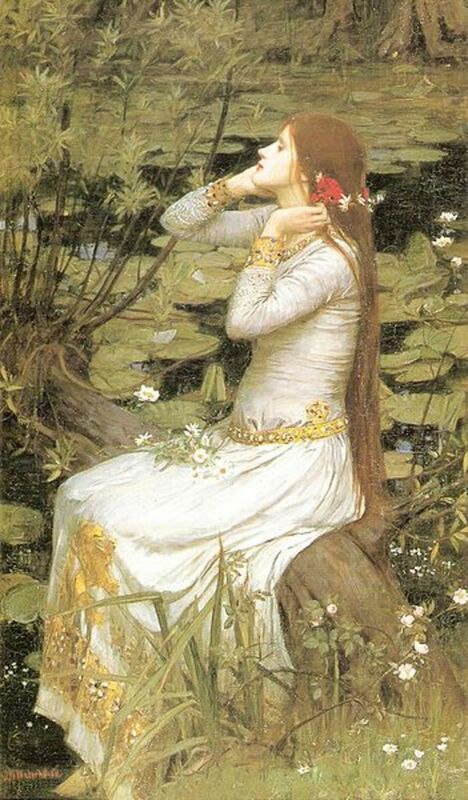 In Waterhouse's painting shown above, Ophelia is decorating her hair with a garland, and there are more flowers and herbs in her lap. She is shown sitting on a bent over willow on the banks of a brook, and we know that this is where she will meet her fate. Alexandre Cabanel (1823-1889) was a French painter, born in Montpelier, Herault. 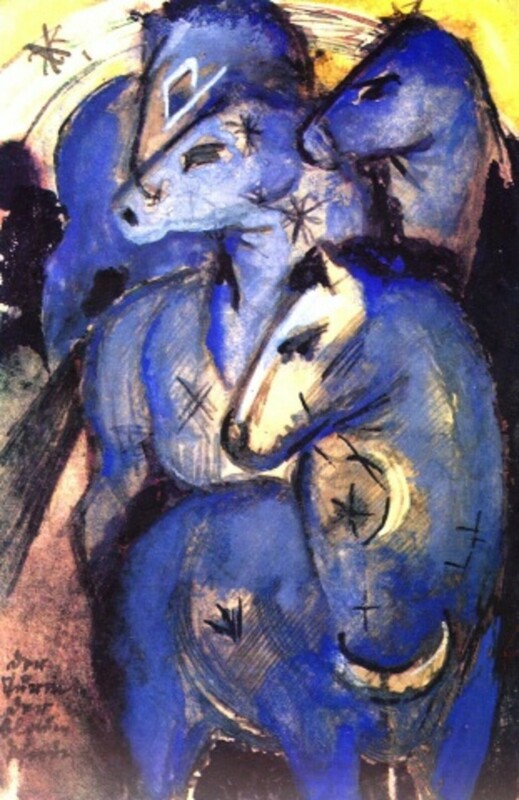 He is best known as an academic artist, and was closely associated with the Paris Salon. 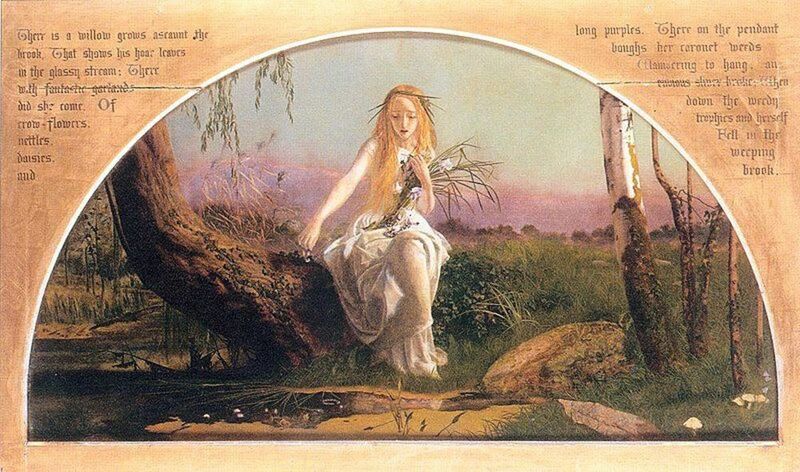 Cabanel shows Ophelia slipping very gracefully from the broken limb of a crooked willow. She doesn't seem too perturbed by the fact that she is about to land in the water. Cabanel has given his Ophelia the look of a medieval princess. She is very blonde and pretty, and her flowers have already dropped into the brook. very fascinating, so many different perceptions of the same figure and character. My pleasure Amanda. I believe you're right. hkristen. During the 19th century paintings of famous, romantic characters from history and literature were very popular. I guess Waterhouse, Millais, etc were just moving with the times! Thanks for stopping by and commenting. This was a fascinating hub on the many artists who did the Ophelia paintings. I've heard of Waterhouse though. Very beautifullly written. Voted up for beautiful! Hi Idigwebsites, you're quite right. Any modern miss worth her salt would have hightailed it out of there, but she was obviously either very stoic, or else desperate for the modelling fee! Thank you for stopping by and commenting. Poor Elizabeth Siddal, if I were her I would complain right away and walked out... anyway, interesting story about Millais' painting. It looks beautifully detailed, even her dress and the small flowers. Gorgeous! Thank you Astra Nomik. I love the Pre-Raphaelite paintings most of all, and never get tired of looking at them. What a beautiful subject for Hubs. I love the paintings here. Hi MosLadder, thank you for the compliment! I love writing these art hubs, but they can take quite a bit of research. My gosh, reading your hubs is like receiving an online education in art history! Thanks for the time you put in! No, poor Lizzie must have been so cold. I'm amazed she didn't just growl at Millais and stomp off to find a fire to warm herself by. Having said that, she probably would have needed assistance to get in and out of the bath dressed in that heavy gown, especially once the cold set in! Thanks for stopping by and commenting. A terrific Hub about one of my favorite genres (in poetry, too) - I can't imagine modeling in a cold bathtub! Poor Lizzie Siddal! Hi Docmo, thank you for your kind comments! Much appreciated! I shiver with sheer pleasure of such beautiful art about a beautiful subject matter. You have truly inspired me today. The research, the paintings and your wonderful writing all makes this hub zing. Well done and awesome! Hi Fay, I'm glad you enjoyed the hub. Thank you for stopping by and commenting. Your hubs are magnificent. Thank you so much for the sharing the artist's inspiration for the artworks. Hi Hello,hello, I'm glad you enjoyed the Ophelia paintings. Thanks for stopping by! 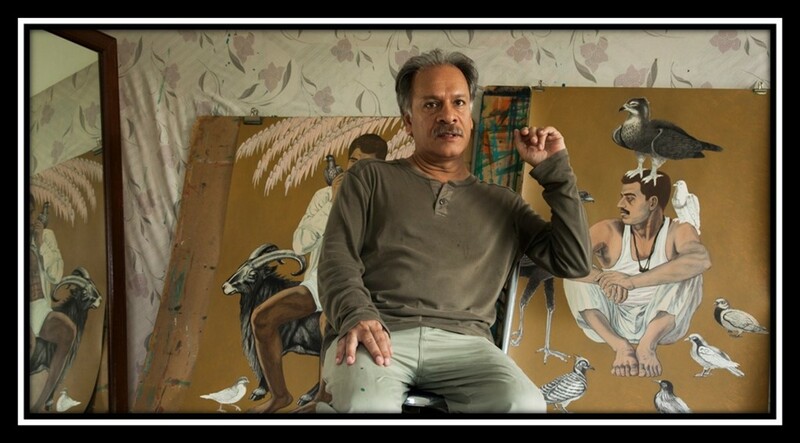 Thank you for all the pleasure you gave in reading your hub and seeing these paintings. Hi Barb, I'm endlessly fascinated by the Pre-Rahaelites and their complex lives. Lizzie Siddall went on to marry another of the Pre-Raphaelites, Dante Gabriel Rossetti. She became addicted to laudunum, and she took an overdose following a rocky period in their relationship. Rossetti painted his masterpiece, Beata Betrix after her death, and it shows a dove dropping a poppy into her lap. Hi amillar, I don't think of you as a Philistine in any way, but I appreciate that not everyone is as obsessed with art as I am! The great thing about the Pre-Raphaelites is that they are easy to understand. 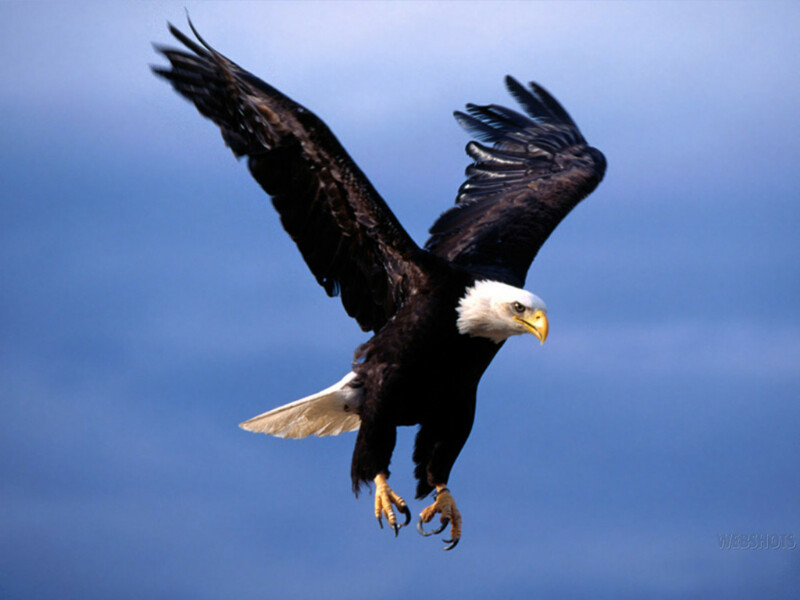 They are true to nature, and their art is very representational. Millais in particular was a very hard-working and meticulous artist. The incredible thing about this picture is that Millais was only 22 when he completed it. He had been a child prodigy, and reached a fantastic level of ability at a comparatively young age. Amanda, what a fascinating tale of Millais's model! The irony of her death takes my breath away, in fact. Thank you for providing this extra insight into this representation of Ophelia. 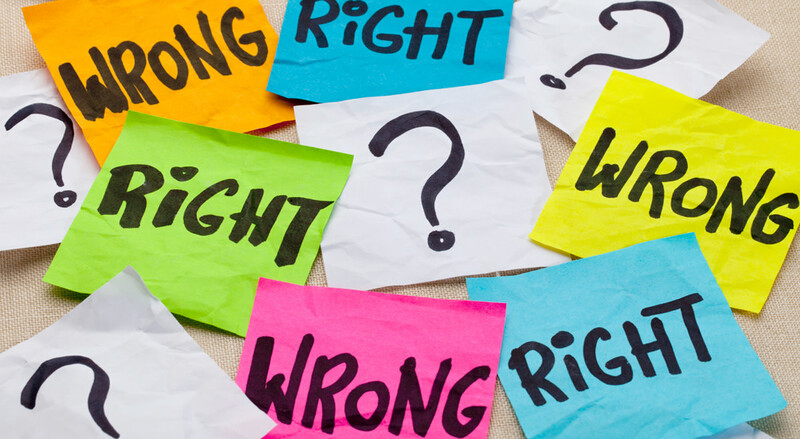 Thumbs up for a hub that is very targeted and as always, well written! There's tremendous detail in these Victorian paintings. I know I'm an absolute Philistine, but I can appreciate the work they put into it. Up and useful, to the artistic fraternity. Yup! I'll go with that. Hi Be-Inspired, it's funny how so many people should be drawn to a painting of what is in fact a tragic scene, but there is something quite haunting and memorable about it. 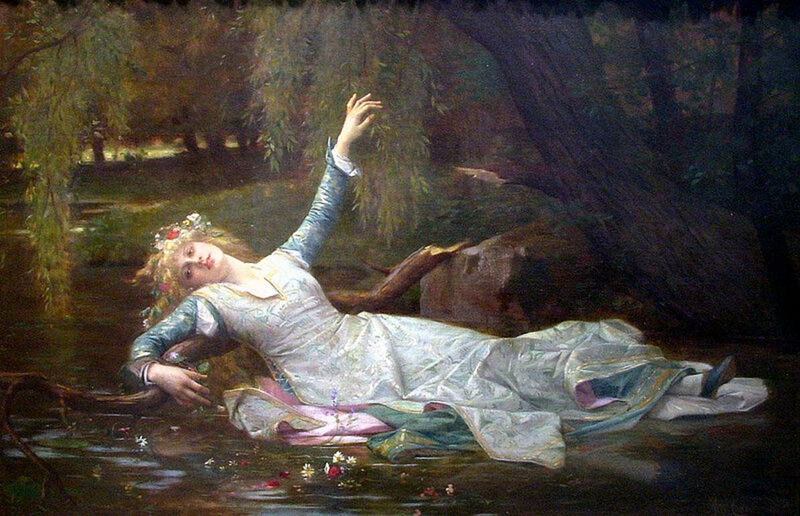 Whilst I quite like the Alexandre Cabanel version, I can't help but smile at the over-dramatic pose, and the nonchalant way his Ophelia is sliding into the water! I wondered the same, but as I'm not a botanist, I couldn't really say for sure. I expect that having the plant-life faithfully recorded would have been satisfying enough for Millais. It certainly would be enough for me! Thank you for a beautiful hub. Ophelia by Millais is one of my favourite paintings, but Ophelia by Alexandre Cabanel is new to me and is delightful, so thank you for bringing this to my attention. Wonderfully created hub, Amanda. Thank you. I was wondering, however, about the change in the flowers and other plants during the five month period of his painting the "background". You know, as well as I, how one type of flower follows the other, so rapidly in the seasons, especially in the South of England. Would he inadvertently captured Spring, Summer and early Autumn blooms? Hi Uninvited Writer, I've always loved the Millais picture too. 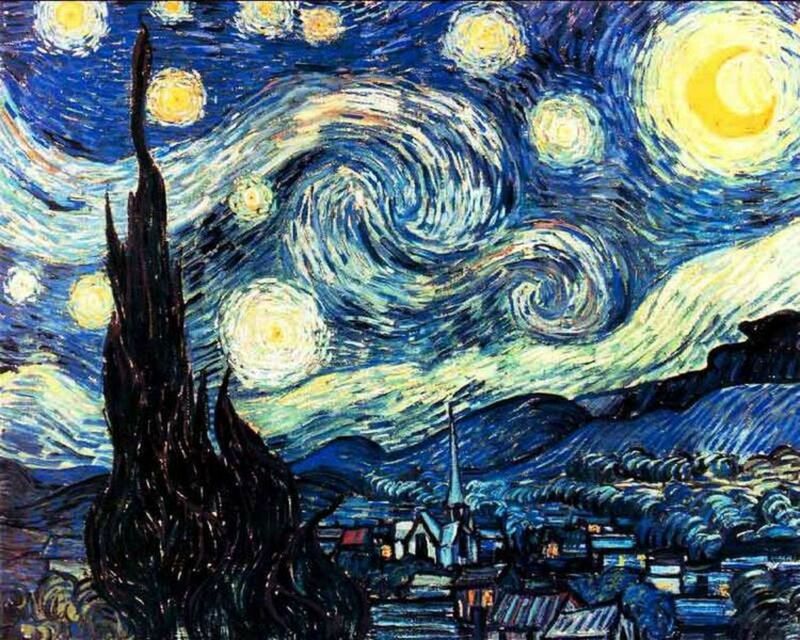 It's one of a handful of paintings that have really caught my imagination over the years. I particularly like the story of how it was painted too. I don't know if young artists are anywhere near so dedicated these days. Hi Bob, I think we all go through a HubPages honeymoon when the whole concept seems so addictive, but eventually most regular hubbers seem to end up on the forums rather than on the hubs. I still flit around from time to time, though I'm quite busy elsewhere at the moment. Lizzie Siddal, BTW, was Dante Rossetti's girlfriend around the time this was painted, so I don't think Millais would have made a move on her. She was a pretty girl though. Hi William, I agree that Ophelia is quite a compelling character, and I've also seen that film. Hamlet is a very dark and tragic play, and the 1948 film version captured the mood perfectly. Thanks for stopping by and commenting. Wonderful hub, I have always loved that painting by Millais. I'm not normally an aficionado of art, Amanda Severn, but I have been fascinated by Ophelia ever since I saw her portrayed by Jean Simmons in the 1948 movie version of "Hamlet" starring Laurence Olivier. These paintings and their history are delightful to behold. I'm grateful to you for this. Hi Lynda, that was quick! Hope you have a good day, and thanks for commenting.